A guide to the James Abdnor Collection and select television ads from the collection are available on the South Dakota Digital Archives. Ellis James (Jim) Abdnor was born in Kennebec, S.D. on February 13th, 1923. His parents, Samuel J. and Mary Wehby Abdnor, were immigrant Lebanese homesteaders. He attended both grade school and high school in Kennebec. He then enrolled in the University of Nebraska, where he joined the Student Council and became president of the Sigma Chi fraternity. His studies were interrupted from 1942 to 1943 with World War II military service, but he graduated with a B.A. in Business Administration in 1945. After graduating, Abdnor returned to Kennebec and worked as a schoolteacher and farmer-rancher. He coached the Lyman County Junior League and Teener baseball teams for more than 20 years. Abdnor’s political career began when he became chair of the South Dakota Young Republicans and farm chairman of the National Young Republicans. He also served as first assistant chief clerk of the South Dakota House of Representatives in 1951, 1953, and 1955. He was elected to the State Senate in 1956 and served until 1968, during which he was chairman of the Joint House/Senate Appropriations Committee for ten years, and President pro-tempore of the South Dakota Senate from 1967-1968. In 1968 Abdnor ran a successful campaign to become the thirtieth Lieutenant Governor of South Dakota, serving with Governor Frank Farrar from 1969-1970. Although he attempted a bid for a seat in the U.S. House of Representatives in 1970, he was defeated in the Republican primary. In 1972, however, Abdnor’s campaign was successful and he was elected to the 93rd Congress. He remained through the 96th Congress, which ended in January 1980. In the 1980 elections, Abdnor challenged incumbent U.S. Senator George McGovern and won a decisive victory. 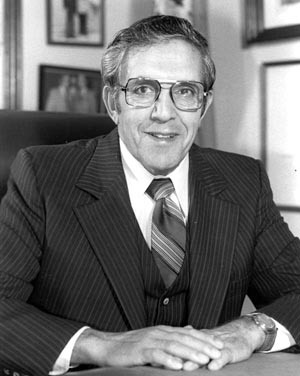 During his time in the Senate, Abdnor served as chairman of the Environment and Public Works Subcommittee on Water Resources, chairman of the Joint Economic Subcommittee on Agriculture and Transportation, and on the Appropriations Subcommittee on the Treasury, Postal Service, and General Government. Abdnor main areas of interest included rural electrification, water development, agriculture, tax cuts, and national defense. Tom Daschle defeated Abdnor in the 1986 U.S. Senate general election. However, Abdnor remained in Washington for two years and served as the Administrator of the U.S. Small Business Administration at the request of President Ronald Reagan. In addition to his political activities, Abdnor was a member of the Methodist Church; a former president of the Kennebec Jaycees; a member of the Elks, Masons, Order of the Easter Star, Consistory, American Legion, South Dakota Wheat Producers, South Dakota Stockgrowers, Farmers Union, Farm Bureau, Izaak Walton League, and Nature Conservancy; chairman of the South Dakota Cancer Crusade; and chairman of the South Dakota Easter Seal. In 1991, Abdnor donated his Congressional papers to the South Dakota State Historical Society. He died on May 16, 2012 at the age of 89.